As far as people that are widely despised go, the humanoid teleprompter readers that populate so-called cable news networks are very high on the list—even more so than Congress. Most of the people you see on television discussing the viral video of the day are not very smart and frequently say really stupid stuff. 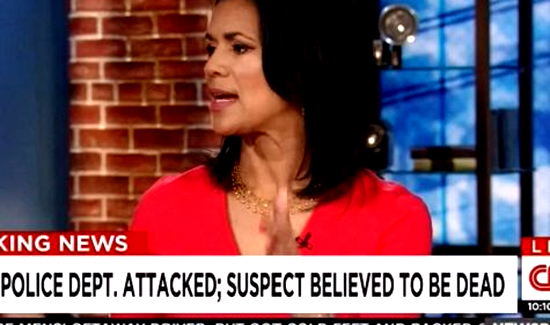 The latest dust-up involves CNN weekend anchor Fredricka Whitfield. Needless to say, all hell broke loose and CNN immediately apologized. Whitfield, who seems about as bright as the average lightbulb in a dirty microwave, also walked back her comments in a typical media non-apology. Anyway, the Dallas Police Association doesn’t take these mea culpas seriously—and why should they? Fredricka Whitfield is a pathetic excuse of a reporter/anchorwoman. Calling a potential cop-killer “courageous and brave” is an insult to EVERY POLICE OFFICER ON THIS PLANET! MS WHITFIELD, DO THE RIGHT THING AND QUIT YOUR JOB! YOU ARE TERRIBLE AT IT!